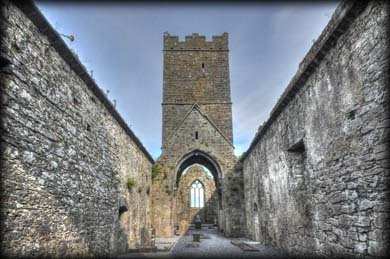 Clare Abbey was founded by Donal Mor O'Brien, the King of Thomond, for the Augustinian Canons in 1189. 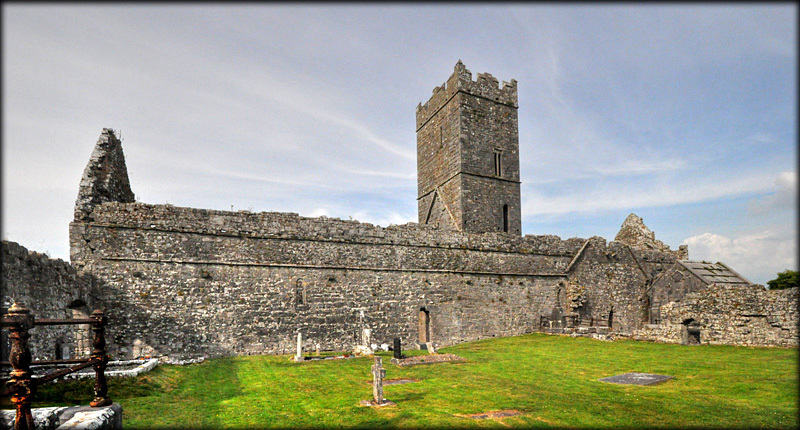 The abbey is situated on the west banks of the River Fergus and is dedicated to SS Peter and Paul. The ruins consist of a long nave and chancel church, separated by a tower, and a cloister with domestic buildings to the south and east of the cloister garth. 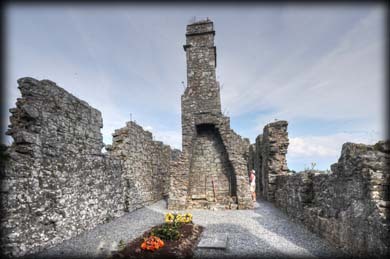 The church was originally 39 metres long and about 9.5 metres wide. The belfry tower was added in the middle of the 15th century separating the nave from the chancel. The east window, seen in the image left, was also inserted during this period. There are some other excellent windows/lights also remaining and a bullaun lies close to the abbey, which I did not locate on this visit. From the N85 there is a superb view of the abbey. My time here was a bit too short as it came at the end of a long day visiting sites at Corrofin, Dysert ODea, Drumcliffe and Killinaboy. I will definitely call back and spend more time here in the future. Situated: On the southside of Ennis. Take the N85 heading southeast till you come to the Clareabbey roundabout. From here follow the signs for the Abbey. Discovery Map 58: R 3468 7576. Last Visited July 2014.